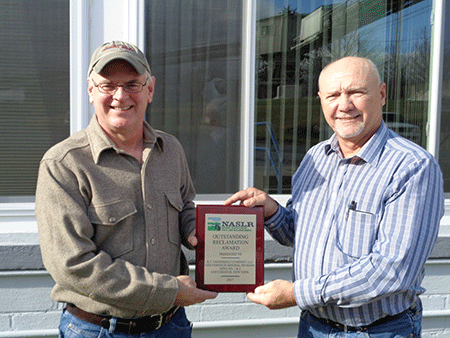 From left, Jamie Knowlden, General Manager, Vanderbilt Minerals, LLC & Jerome Zaykoski, Region 6 Minerals Manager. FOWLER -- Because of its "dedication to reclamation," the New York State Department of Environmental Conservation (DEC) nominated Vanderbilt Minerals, LLC – Gouverneur Mineral Division, for a National Association of State Land Reclamationists award for non-coal, according to DEC.
Vanderbilt accepted the award at the NASLR award ceremony in September. “The effectiveness of Vanderbilt Minerals’ reclamation efforts are remarkable. It is a pleasure to work with a company that exhibits an impressive environmental ethic,” DEC Region director Judy Drabicki said in a prepared statement. “Vanderbilt Minerals, LLC is proud to have been nominated and to have received this award. Reclamation of land is a responsibility to us as a business and of course for the betterment of the environment,” Jamie Knowlden, Vanderbilt Minerals, LLC general manager said in a DEC news release. 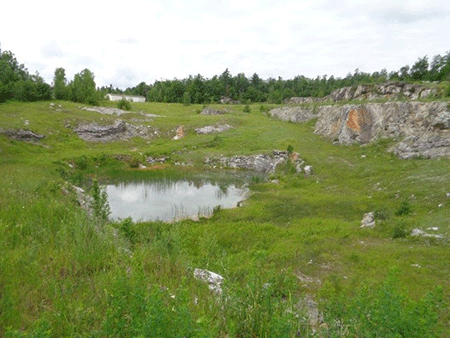 Vanderbilt stopped talc production early in 2008 at its number 1 and 2 mines in the Balmat area in St. Lawrence County. The quarry pumps were shut down early in 2008 and reclamation of affected lands began shortly thereafter. The company worked closely with DEC on reclamation of 184.7 acres of affected lands. Major revegetation work was completed approximately five years ago, and the vegetation is "thriving," according to DEC. In June, the mine was deemed 100 percent reclaimed, DEC said. The No. 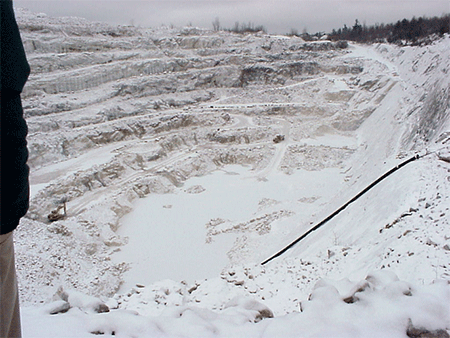 2 mine quarry viewed in November 2004. Presently 90% full of water. View of the reclaimed No. 1 mine open pit.